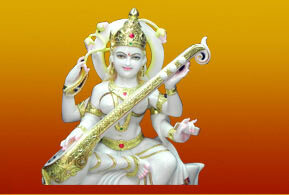 We offer statues of Ma Saraswati in different colours and postures. They are made of white marble procured from Rajasthan, keeping in line with Ma Saraswatis complexion. The idols are available in different postures like Saraswati sitting on a lotus, or Saraswati standing. The ornaments of Saraswati have been made using colourful stones to add dimension to the idol. The marble used has been polished and cut well so that there are no jagged ends in it. The size of the idol differs to cater to the needs of the space people have reserved for keeping the idol in their puja room. The marble used is of such good quality that it will not change colour even on prolonged exposure to air. 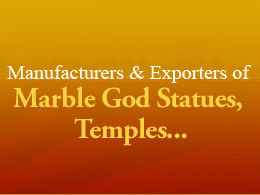 We offer the idols in different specifications and industrially competitive prices. 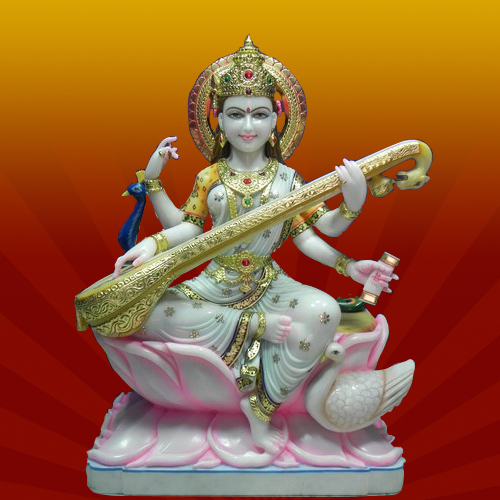 The marble Saraswati statue that we offer has Saraswati, the Goddess of wisdom and knowledge, holding her Veena across her legs, sitting on a lotus with her swan behind her. All the detailing, including her crown, Saree and ornaments have been done using colourful stones to add a dimension to her. 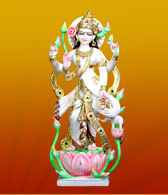 The style of the idol is a traditional one and it is made using white marble to match her complexion. The marble used has been procured from the best limestone quarries in Rajasthan, so that the marble doesnt lose colour on prolonged exposure to the air. The stone has been polished and cut well so that there are no rough edges. We offer the idol in different specifications to suit your need and the space where you want to keep the idol. 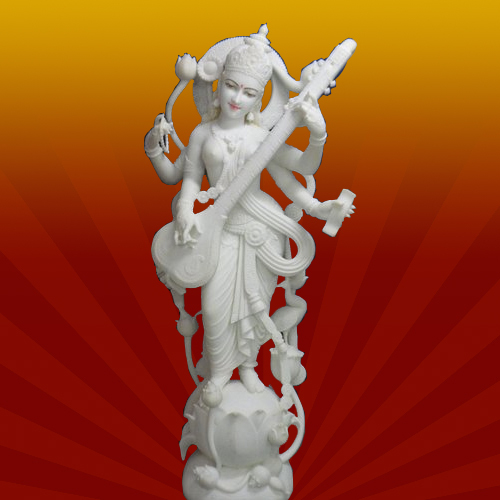 The marble Saraswati standing statue that we offer is made using pure white marble, procured from Rajasthan to match Maa Saraswatis complexion. 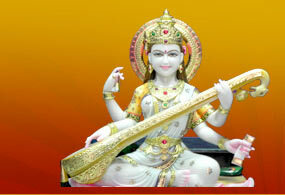 She is shown standing here, with her veena in her hands and she is standing on a lotus. The detailing of the saree and her ornaments has been done using golden stones, to add dimension to the idol. The idol is very compact so that it looks good in your puja room and it is available in different sizes to suit your available space. It is cut and polished well, so that there is no unevenness in the idol. It is very attractive to look at and people are full of praise for it. We can offer the idol in different dimensions and colour, depending on the demands from customers. 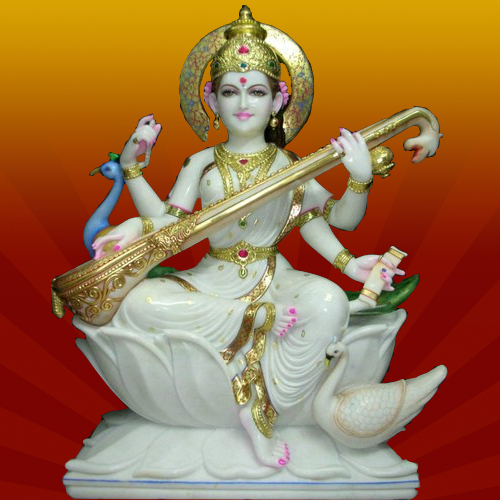 The marble Saraswati, the Goddess of learning, wisdom and knowledge that we offer is made of white marble, procured from good limestone quarries, to match her complexion. Here, Goddess Saraswati is sitting on a pink lotus, and is wearing a saree that is adorned with pink flowers and her ornaments, including her tiara and her halo are golden in colour. Her veena is kept across her lap. All these detailing have been done using colourful stones and paints give a 3 dimensional effect. The statue is perfect for keeping in the puja room and people get instantly attracted by the statues simplicity and beauty. Because the cutting and polishing is done well, it is smooth and has no jagged end and is long lasting, without being affected by the air it is exposed to.